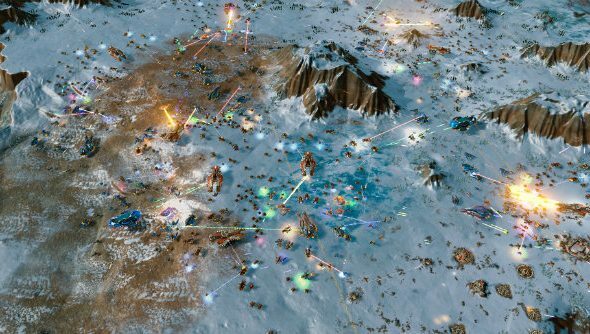 Post-human RTS Ashes of the Singularity just got its first major patch, addressing some balancing issues across the entire game. If you’re reading this you’ll probably like our list of PC’s best strategy games. General unit building, economy, AI difficulty and campaign difficulty have all had a significant balance pass, nerfing the strong and buffing the weak to make sure as many different playstyles as possible are viable. In addition to these tweaks, the “Fringe” map has been removed from Ranked play, because it’s unbalanced, at a guess. There’s definitely a theme here. If you want to see all of the balancing tweaks, head over to the full Ashes of the Singularity patch notes. Outside of balancing, though, there’s also been a bit of bug fixing and polishing, but specifically for forests, with tree size adjusted to make them appear more prominent on the terrain. Ashes of the Singularity is $49.99 on Steam.